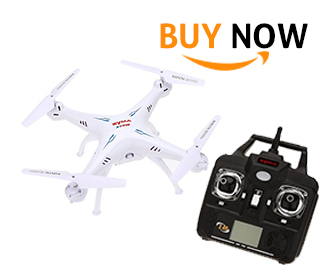 Product Description: Syma has launched this 4 channel remote controlled drone that can be very engaging for young and old alike. This is a light weight gadget made in plastic and the box is packed with the quadcopter drone with HD camera, 3 Lithium Polymer batteries (2 are given as spares), 4 blades, 1 controller, 1 support frame, 1 USB charger, 1 screwdriver and a key chain. This white colored drone is headless, so there is no differentiation between the head and the tail portion and it balances uniformly when controlled in a proper manner. Features: Syma X5SW has 4 channels to give a stable flight. The 6-axis gyro technology ensures that the drone is perfectly balanced during take off, landing, 3D flips, etc. The 3.7 V 500 mAh Lithium Polymer (LiPo) battery takes around120 minutes to charge. However, it has been noticed that the battery shows optimum charge within 40-45 minutes itself. On a single charge, the drone can fly for around 6-7 minutes. Additional 2 batteries are provided so that you can recharge them and keep ready in order to have a longer session of flying. All that you need to do is replace the drained one with a freshly recharged battery and continue having the fun. The USB charger makes charging very convenient even if you are outdoors. The transmitter or controller has a range of 50 meters and the HD camera has the capacity to capture good quality images and videos. Another interesting feature of this drone is that after installing an app on your iPhone or Android-based smartphone, you can have WiFi real time transmission of the recording between the drone’s built-in camera and your mobile that has been configured to tune with the controller. Advantages: The 6-axis gyro with 4 channels ensures a smooth and stable flight. The videos captured by the inbuilt camera are instantly transferred to your mobile via app installed and synchronized with the controller. The headless drone eliminates the confusion of front or back direction and thus facilitates easy maneuvering that is in relation to the direction of the pilot. The drone performs 360 degrees flips and has a stable flight that enables proper capturing of videos and taking quality images. Another great advantage of this Syma X5SW drone is that since you get 2 additional LiPo batteries, there is no need to halt your flying for long since you can immediately replace the drained battery with a fully charged one and at the same time put this used battery for instant charging using the USB charger. Disadvantages: No gadget or toy is totally perfect. There are minor flaws in everything that one buys, irrespective of the category of the product. The disadvantage associated with this drone is that unless and until you get the hang of using the remote efficiently, there are chances of the drone drifting away and getting stuck in tree branches or just crashing due to misjudgment in controlling the direction and height. Thus, it is advisable to choose an absolute open ground to practice the controlling to avoid such mishaps. Since it is a plastic drone, little or no wind is an ideal condition for flying, else the strong draft tends to make the flight unstable. 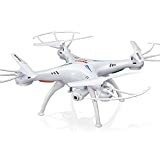 Verdict: For the price tag below $50, this drone is definitely a good buy for beginners, as, if not professional quality, it yet captures decent quality images and videos. It is a good gadget to record the view of your neighborhood and other places.